Due to some time-consuming computer problems in August I’ve been unable to produce an Astro-Energy report for September 2018. The problems are now sorted so I hope to be blogging again soon. August begins in the middle of an eclipse season which continues until the 15th. Last month was an intense journey for many, with solar and lunar eclipses challenging even the most balanced among us! As we embark on a new month we have one more solar eclipse to come on the 11th before things begin to ease. Mars has been conjunct the South Node since the end of May, anchoring our attention in the past, rationalising the adoption of old habits over new approaches and generally holding us back when we most needed to move forward. This has made recent weeks especially difficult as eclipse energies have demanded new responses while our instincts have told us security lies in the familiar. This tie to the past weakens as August begins. For some it may feel like waking from a mysteriously seductive sleep in which reactions and behaviours have felt automatic and involuntary. From 5th August we should be far more present and better able to make informed decisions with clear intent rather than acting under the influence of unconscious impressions and emotions. Despite this collective return to a more present state of mind, deep inner change continues throughout August. With between five and seven retrograde planets all month – with the dwarf planet Eris making eight – our inner life will be deeply impacted by external experience. Seemingly inconsequential events may affect us more significantly than anticipated, triggering unexpected reactions in need of attention. By way of support a semi-sextile between Chiron and Uranus, which continues until 22nd of August, provides both the means and motivation to liberate ourselves from the grip of difficult emotion. What would once overwhelm may feel inexplicably less intimidating. Inner turmoil that would usually dominate days may pass by in an hour. 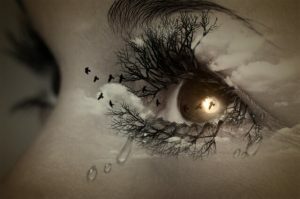 In a mysterious and yet timely blessing, intense emotion will contain the key to its own demise and we’ll have the eyes to find it, even if they’re filled with bitter tears as we do. An ongoing square between Chiron and Saturn (first mentioned in my July report here) continues its spiralling dance through time and space. We may discover not only that we can step out of current timelines, disrupting what felt to be unavoidable events, but that we can also command the consequences of past actions to reshape our destiny. A trine between Neptune in Pisces and Jupiter in Scorpio throughout August, provides a gentle yet penetrating backdrop, supporting compassionately insightful responses to life in these unpredictable days. It may help to think in terms of involution rather than evolution this month. We must mature and progress inwardly before impacting the outside world in constructive ways. Actions and intentions are often saturated with emotion and unconscious motivation. Honing our awareness of such influences will enable incisive action in due course. But for now, growth is internal: an expansive process of unflinching self-acceptance and fierce love which allows for the integration of inner ‘demons’ into the self. This inner shift then becomes the source of peace, progress and hope in the outer world. Without it, humankind will continue to project the dark underbelly of the psyche onto others creating enemies, wars and countless inhumanities inflicted upon life in all its forms. A square between Mars and Uranus which began at the end of July augurs continued intensity in the first two weeks of August. Intent on disrupting the status quo, these two celestial mights will mess with anything and everything that provides a sense of security and predictability! We may see unusual weather or geophysical events, the sudden rise of new ideas which challenge the current order of understanding or a global push towards the destruction of outdated systems in favour of modern innovation. This square feels like progress and threat at the same time. The challenge is to react to disruption in constructive ways, rather than give in to fear. A further square from Jupiter in Scorpio to the Sun in Leo between 3rd and 10th August challenges those who assume a right to dictate to others, revealing hidden motivations and the weak-links in arguments and rationalisations. The extent to which we’re invested in controlling others will dictate the extent to which this square scuppers our activities. If we seek an audience for personal gain and lust after recognition for recognition’s sake, Jupiter in Scorpio will pull the rug from beneath our feet. If, however, we have the well-being of the whole at heart, even as we seek acknowledgement for our own contribution, Jupiter will shore up the ground beneath our feet, empowering us to draw upon inner resources for positive gain. Venus, the planet of love, enters her own sign of Libra on 6th August, remaining there until 9th September. Here she knows deeply the redeeming power of intimacy, encouraging faith in humanity and a willingness to see the world through another’s eyes. She is gentle and can’t be doing with arguments and power games, preferring a peaceful life which allows for kindness, appreciation and affection. Sometimes we let things get too heavy because we can’t let go and move on, even when getting our own way becomes a hollow victory at the expense of our humanity. Venus in Libra encourages us to expand the heart and embrace difference rather than harden around it. Whilst she may sound naïve about the forces unleashed in this world, her innocence is not ignorance but familiarity with love in all its guises. She knows that a commitment to love no matter what is the greatest alchemy, and far from denying the darkness within it embraces it, knowing nothing is rejected in the heart of the divine. We humans can be slow to change and quick to judge, slow to forgive and quick to condemn. This Venus assures us it’s all okay, this strange dance of life, these comings and goings, meetings and partings. She’s happy to wait in the wings, gently encouraging us into ever deeper love until we relinquish, forever, the needy and manipulative dynamics that often pass for it. On 7th August Uranus begins five months retrograde (first in Taurus, then in Aries) challenging the restrictions we place around ourselves. Uranus is never one for ‘safe’. Not in the way we often mean anyway! ‘Safe’ to Uranus is the readiness to embrace absolutely anything at any moment – living the full catastrophe and unreserved ecstasy of our lives with unbounded passion and unwavering dedication to its fulfilment no matter what. If our definition of safe is a predictable, tameable life, Uranus has us in its crosshairs and the coming months will provide the opportunity to free ourselves from some of the foreboding that shapes our lives. It’s easier to spot outer restrictions than inner ones. We’re usually so close to the beliefs underpinning our self-image we have zero objectivity. It can be impossible to see ourselves as anything other than who we think we are. This blind-spot is the source of our greatest limitation. We can defy the restrictive expectations of the outside world all we want, but if we can’t perceive where we suppress ourselves we become our own oppressor. Uranus retrograde says it’s time to stand back, take an objective view and question the most fundamental assumptions underpinning our identity. Why is it so important to see ourselves a certain way, be acknowledged for particular qualities or define ourselves as we do? What do we gain and what do we lose? What’s really going on? And most importantly, what would happen if we dared let even our most treasured identity be blown to smithereens by Uranus’s liberating power? If we follow this lead in the coming months fear of change can dissipate, the terror of non-acceptance subside and the oppression of ‘what will they think?’ diminish, deferring to a richer engagement with life’s ups and downs. Uranus’s square to Mars in Aquarius emphasises the importance of detachment from the reactive emotional charge triggered by threats to our self-image. If an aspect of our identity both limits and defines us in equal measure, letting it go may threaten the very fabric of our life. Facing the void that follows its demise can trigger intense fear, and there’s no shame in this. Deep-rooted change unsettles us to the core, challenging all we’ve relied upon to face the world each day. It takes profound courage to do this inner work. Whilst Uranus assists us with its own special brand of awakening, we do our part by opening to the possibility that we’re not who we’ve perceived ourselves to be. Softening around our self-beliefs, entertaining the nuance of ‘maybe I’m not who or what I thought’, creates space for new perspectives. If the contraction of past trauma and unhealed pain clips our wings in the present, the coming months will allow us to tend these wounds. It may hurt at first, but the freedom of healing will more than eclipse the numbing entropy of a life spent avoiding the pain. As Uranus settles into its retrograde journey we have a solar eclipse in the 19th degree of Leo on 11th August. The final of three eclipses since mid-July, this one both consolidates and facilitates embodiment of the changes demanded by the other two. Aspecting Pluto, it affirms that what looks like destruction is the beginning of new life and references the primordial chaos from which all beingness is born. As we awaken we encounter this chaos as the rising of our shadow self: those thoughts, feelings and impulses we’re mobilised to avoid. Just as an abscess must discharge in order to heal, so must we allow the full force of our instincts to arise into consciousness. This process of inner rectification challenges us to ever greater levels of self-acceptance. We are not made ‘spiritual’ by identifying only with positive emotion and loving intent. Denial of the shadow is not an act of wisdom but of inner subterfuge, designed to protect the fragile ego which cannot yet accept the truth of who we are. With so much polarisation occurring on the world stage – violence, narcissism and protectionism at the highest level – it’s easy to lay claim to the moral high ground and yes, it is important to call out abuses of power for exactly what they are. But it’s equally important to look within at our own feelings of superiority, hatred and intolerance. They’re the ones we have power over, the ones we can actually change. This solar eclipse strengthens us to acknowledge and embrace them, curtailing the chaos wrought when they’re denied and ignored. In turn this diminishes, bit by bit, the power of the collective shadow to foster divisive ideologies of hatred and exploitation around the world. A trine from Eris to the Sun between 13th and 20th August invites us to undertake a radical act of remembrance: recognition that we don’t leave behind the impulses of less ‘civilised’ days. Instead we must integrate them into our psyche and society, transmuting their energy into a force for progressive change. Mars also retrogrades into Capricorn on 13th, where it remains until 11th September. Here it keeps our feet on the ground even if inner whirlwinds threaten our stability. This Mars seeks practical outcomes without which good intentions are nothing but hot air. It will help us manifest a stabilising presence and tackle pragmatically any challenges we face. Call upon its energy when emotions are running high and the mind cannot be tamed. It will anchor you to tackle, with a healthy dose of ‘common sense’, whatever threatens to throw you off course. During this time we may encounter echoes from mid-May, allowing us to tie-up loose ends, rectify oversights and even remake key decisions to better reflect progress made since then. If so, Mars helps us manage the practicalities of doing so and plan adequately for the consequences of a change of tack. Many will be relieved to know that the eclipse season comes to an end on 15th August, as does the square between Mars and Uranus which has stirred up trouble in the past three and a half weeks. This easing of what has been a considerable amount of pressure for quite some time may feel disorienting at first, as if we’re missing something or have overlooked an important task that remains undone. It may take a few days for us to settle into this more low-key ambience, but as we do we’ll begin to feel the impact of a trine between Saturn and Uranus which will make its supportive presence felt until the end of September. This trine may come as an answer to many prayers, allowing us to translate recent inner shifts into external change. The frustration of having to accommodate old conditions whilst undergoing radical inner transformation will give way to burgeoning clarity about how to reorient our life to reflect new awareness and priorities. Saturn in Capricorn reminds us that every action has a consequence and every choice sends ripples through our life, whilst Uranus in Taurus emboldens us to embrace new possibilities which seemed too outlandish to contemplate before. This combination working in harmony allows for the implementation of radical change in a considered and responsible way. It may take longer than we hoped, be more complex than we’d imagined or entail greater effort than we’d anticipated, but this recent eclipse season has prepared us for the tasks ahead and Saturn and Uranus now walk either side of us to guide our way. Mercury stations direct in the 12th degree of Leo on 19th August whilst aspecting Venus in Libra, forging an alliance between our subjective worldview and acceptance of ‘the other’. Issues encountered since Mercury first entered its retrograde ‘shadow’ on 7th July may have raised some interesting questions about how we express ourselves in relationships. Are we mobilised to get our point across at all costs or do we make space for other views to be aired? Do we assume our perspective to be correct without considering its subjectivity? Do we allow others too much space to impose their opinion whilst failing to voice our own? As Mercury stations direct it may help to reflect on interactions in recent weeks and what they’ve taught us. It continues exiting its retrograde shadow until 1st September, so there’s still time to revisit problematic communications or misunderstandings which have yet to be resolved. On 23rd August the Sun begins its month-long journey through Virgo whilst at the apex of a Yod formed by Chiron and Mars. Emphasising the importance of tiny adjustments to self-expression, the challenge is to be forceful enough to make our mark but yielding enough to recognise when personal nuances are missing the mark. During this month the ego is a tool to be honed, sharpened and calibrated with great care. It exists to serve the greater good, not to be served. Self-seeking tendencies will meet with frustration until intention is purified and the ego realigned with life’s flow. Once this recalibration has taken place we can tweak the minutiae of daily life with impacts that ripple far beyond our immediate sphere. A Grand Trine in Earth formed by the Sun, Uranus and Saturn between 23rd and 28th August offers a calming influence. During this time we may feel reluctant to step outside our comfort zone, preferring to stick with the familiar and enjoy some semblance of emotional and spiritual rest. If, however, there are tasks to be done, this Grand Trine provides endurance, stability and focus to apply ourselves and use any resources at our disposal effectively. If a much-treasured goal occupies your attention at this time, formulate realistic plans which gradually move you out of your comfort zone whilst building stable foundations for each step of the journey. Avoid unnecessary risk but be prepared to nail your flag to the mast and commit to pursuing your goals when you know it’s time to do so. A concomitant square between Pluto and Venus which begins on the 23rd and ends on 30th August provides the courage to redefine our desires in the wake of an intense few weeks. We may, by now, be facing a very different direction to the one that held our gaze at the beginning of July. If so, Pluto reminds us that by exploring our deepest desires we meet our highest potential eventually. The winding path to their discernment may bear obstacles, false starts and unwelcome surprises, but it leads us into ever deeper union with the divine. An auspicious full moon in Pisces on 26th August sits at the apex of a Kite, overcoming rigid perspectives and entrenched views that divide. It affirms that behaviour is not the final arbiter of worth, and we can honour our shared humanity whilst challenging the cruelty that perpetuates suffering across the globe. Illuminating the restorative power of compassion and the courage of an open heart, this moon roots us deeply in the knowledge that all life is sacred, calling us to live with greater awareness as a result. With Uranus currently retrograde in Taurus we’re reminded just how fragile our place in nature can be. Climate catastrophes, food instabilities, the consequent conflict and strife: all are becoming ever-present features of the modern age. This full moon reminds us that a planet under siege to egoic desire won’t stop fighting back until those desires have been curtailed. We are each and every one of us beholden to play our part. For only by accepting we are part of nature, not its keeper, can we hope to thrive in an otherwise uncertain future. On 27th August Mars stations direct in Capricorn. Since turning retrograde two months ago it has clarified issues of motivation and intent, revealing some of the less obvious influences which shape who we are. Its change in direction enables external expression of what we’ve learned during its retrograde phase. Progress which has slowed during this time will gather pace in the coming weeks, underpinned by enhanced clarity born of knowing ourselves better than before. Mars reminds us now that inner work must reflect outwardly eventually, and lip-service to changed ideals or new priorities means nothing if life continues on in the same old way. As August comes to a close we can look back on an eclipse season that shook many foundations, challenged preconceptions and asked courageous honesty of us all. For those who accepted this challenge, the end of August will come as something of a balm to soothe the difficult emotions this entailed. For those who shied away this time around, there’s another eclipse season in six months so all is not lost! We undertake this journey in our own time, at our own pace. And we all arrive eventually, not a moment too soon or too late.